Experience the inviting atmosphere of a brasserie. 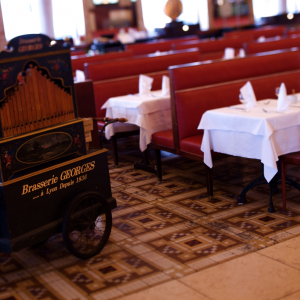 In terms of décor, ambiance and cuisine, brasseries have it all. It's hard to go wrong with one of these eateries. You can enjoy classic dishes, which are often personalised by the chef. If you're dying for a steak tartare to make a change from andouillette, we can point you in the right direction! Both a restaurant at lunchtime and a tapas bar in the evening, Le Métronome excels in both areas! Located on the site of the Lyon Vert Casino, the brasserie proposes refined cuisine with unbeatable value for money. Located opposite the majestic Gare des Brotteaux, this brasserie remains one of the most striking examples of Art Nouveau in France. Located in the heart of the Cité Internationale with its stunning architecture by Renzo Piano, you'll find "33 Cité" right next to Tête d'Or Park. In its cosy baroque setting with velvet bench seats and carpeted floors, we find the first establishment by Jacques Garcia in Lyon!